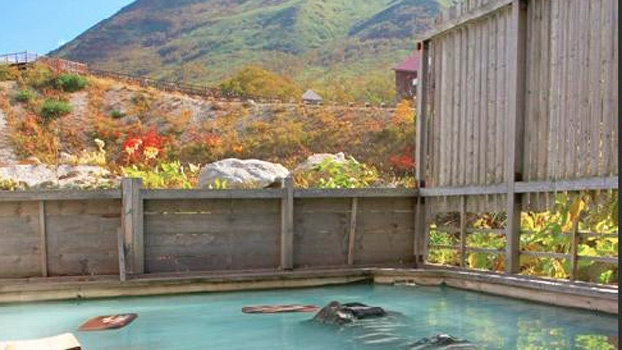 The Niseko area is spoilt for Onsens, from traditional to modern, those favoured by the local potato farmers to those with a glamorous vibe, the hot mineral springs varying in their mineral qualities from spring to spring. We recommend trying a different onsen every day and taking your towels and a change of clothes with you when skiing or snowboarding so that you can go straight from the powder to the steam. Of course if you’re riding a bike and you pass an onsen near the end of your trip, you can always rent a towel rather than carrying one with you. Here are just a handful of our favourites. A real favourite and about nine kms up the hill from Tanuki Lodge Goshiki Onsen is one of the most famous onsens in the region. Surrounded by a white birch forest, the naturally sulphurous spring water features in both indoor and outdoor baths with stunning views of the forest. 100% of the spring water is straight from the source, with no additional water added. The spring has an acidic sulphur content, and is believed to be beneficial for neuralgia, frozen shoulder, gynecological illness and high blood pressure. Acidic springs, it is said, can have an antibacterial effect and help with chronic dermatitis, but be careful if you have sensitive skin and be sure to wash yourself with fresh water after bathing. The newer of the two indoor baths features white cloudy nigori-yu water, very popular with onsen enthusiasts. The ramshackle looking buildings date from the Meji area and the rust coloured sulphur fields surrounding the onsen add an other-wordy feel. The eggy-smelling water is offset by the serving trays floating in the bath on which to rest your drink. Owned by Rankoshi Town and located behind JR Konbu Station Yuusen Kaku has kelp-based water which is said to be very good for the skin. Once inside the onsen you can move between baths at temperatures of 39C, 40C and above or plunge into the 15C pool. The hottest bath is outdoors. You can also book private onsen rooms here, there is a gentleman doing very cheap massages just near the entrance to the public onsen, as well as a sauna, restaurant/cafe, souvenir stand and local produce. Popular with both locals and tourists alike. Like Yuusen-kaku this isn’t the most picturesque of onsen, but don’t be put off by appearances! Located opposite Niseko Station and another local council-run onsen, it is one of the most modern onsens in the area, while managing to retain a great atmosphere. With both indoor and outdoor pools there are also private onsens, an in-house masseur and a sauna. A smaller onsen with only one indoor pool this onsen is really all about the deep outdoor pool in a forest setting and a local favourite. Geothermally heated and one of the onsens reliably reaching nice high temperatures. Recently refurbished and one of the most famous of the local onsen, Yukichichibu boasts ten outdoor pools including a mud bath on the women’ side. Set just below the sulphur infused slopes of Iwanopurri it is no surprise to learn that this is a sulphur spring, (io sen), said to expand the blood vessels and help with cuts, arteriosclerosis, hypertension, chronic dermatitis, chronic gynecological disorders and gout. The sulfur is also said to be good for acne and spots as it can soften any hardened keratin on the surface of the skin. Read our tips on onsen etiquette and practice.